We never know when life events will disrupt every facet of our personal world. As a creative, it can be challenging to continue working during times of emotional upheaval. Stop by My Book Therapy’s Learn How to Write a Novel blog to find out what I did when an emergency room visit uprooted my NaNoWriMo schedule. 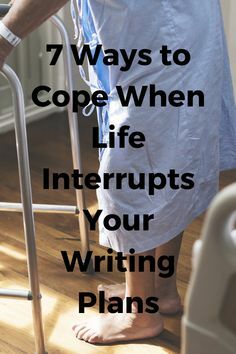 Check out 7 Ways to Cope When Life Interrupts Your Writing Plans. Some links on this website are affiliate links. I only recommend products and services that I use myself. When you purchase through an affiliate link, I may receive compensation. This does not alter your price and helps support my website so that I can continue to provide valuable content.